The end of summer was sweetened by a visit from my six-month-old granddaughter, Josephine. We’d not seen each other since Memorial Day weekend, when we were together at our Catskills home. Josephine took her first ride on my garden tractor then, as we rode down to our lower meadow to plant a weeping willow in memory of her uncle, William. This recent visit was filled with firsts. There was, of course, Josephine’s development in the interim to marvel at. She was rolling over, sitting up, and chewing on anything and everything available to her, with an uncanny and particular fondness for all those white tags that either give washing instructions or threaten to bring the law down upon you if you remove them. Josephine’s genius for locating and deriving pleasure from those tags is unparalleled – certainly in this adoring grandfather’s eyes. The firsts included lots of “swimming”. Time spent in the water: standing while being held, or sitting in her Crab, a floating device she can sit in with holes in the bottom which allow her to kick her legs to her little heart’s content. And kick she did. “Kick, kick, kick”, became a refrain from parents and grandparents alike. Josephine’s firsts included saltwater (Long Island Sound and Great Peconic Bay) and freshwater (The Beaverkill River and a nearby pond). She and the Crab were already veterans when it came to swimming pools. Josephine is a water baby. From her bath or shower to the cold of the river, she delights in all the sensation water has to offer. There were food firsts, “solids” to taste and smear: sweet potato, pear, carrots from grandfather’s garden (happily prepared by grandfather himself). Then firsts from nature. She saw her first black bear and her first bald eagle, both at relatively close range. Things adults forget to take in: bare feet in wet grass, the captivating magic of a breeze moving leaves in the trees back and forth, the mystery of one’s feet disappearing in sand as gentle waves wash up and fall back at water’s edge. The permanence of things had become an issue of some concern to Josephine. Properly so in terms of her development. She delighted in peek-a-boo games. Wondered what happened to a dropped toy. More to the point was growing apprehension over the disappearance or absence of her mother. We adults consulted Selma Freiberg’s The Magic Years or other resources on separation anxiety. Josephine would fret or cry whenever her mother’s disappearance compelled her. There were times when all the snuggling, hugging and kissing by her grandfather simply wouldn’t suffice. On our last day in the country Grandfather’s company was sufficient, however. At least for a spell, while the rest of the adults packed for returns to New York City and Chicago respectively. Josephine and I took a walk outside, around the house. There was a slight breeze, just enough to move the trees and flowers and make the fine hair that gives Josephine the appearance of having a Mohawk stand up just a bit. I held her while we circled the house together. We smelled the sweet clethra and the spiky cleome. We crunched the thyme, some of it still purple, on our rock steps. We stopped by the coreopsis, looked at butterflies in the bee balm, made sure the deer hadn’t eaten Black-eyed-Susan’s or daisies or silver mound. We put our feet in the damp grass and looked at William’s willow. The goldenrod swayed as we came back to the front of the house and plucked a small yellow flower from the potentilla to put in Josephine’s hair. Balance on her head is what we settled for, just long enough to share with her Mommy and GranMarg. A day later we were at JFK, Mommy Elizabeth strapping a baby carrier in front of her, being helped into a backpack, grabbing a purse and a suitcase. I held Josephine, the last addition to Elizabeth’s load to carry into the terminal, while tears streamed down below my sunglasses. For two weeks I’d done my best to console Josephine when she felt abandoned or fearful. Now it was my turn. William is more than a willow. He’s a dead son who heightens my apprehension about the rest of my family. I told Josephine she had the best mommy in the world, told Elizabeth Josephine was the best baby in the world, handed off Josephine, hugged them both and cried as I watched them disappear into the terminal. For Josephine separation anxiety may be a “stage” she passes through. Who knows about grandfather? Josephine with her Dad Johnny Anderes. 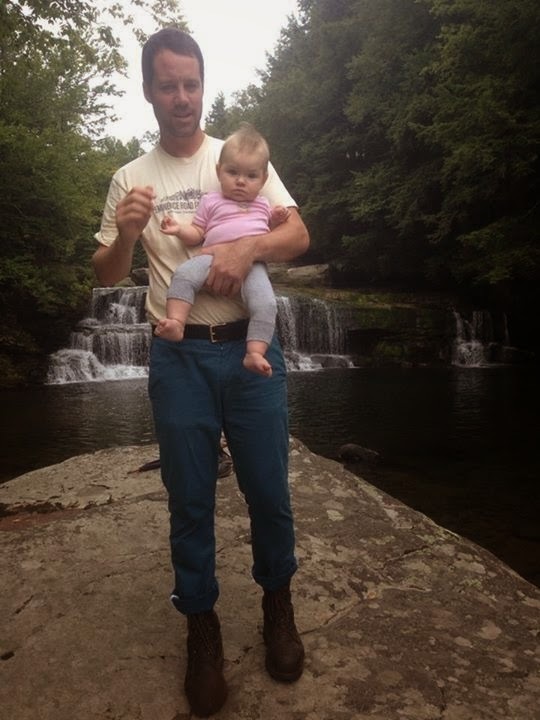 Beaverkill Falls 8/31/14. Where she saw her first bald eagle.